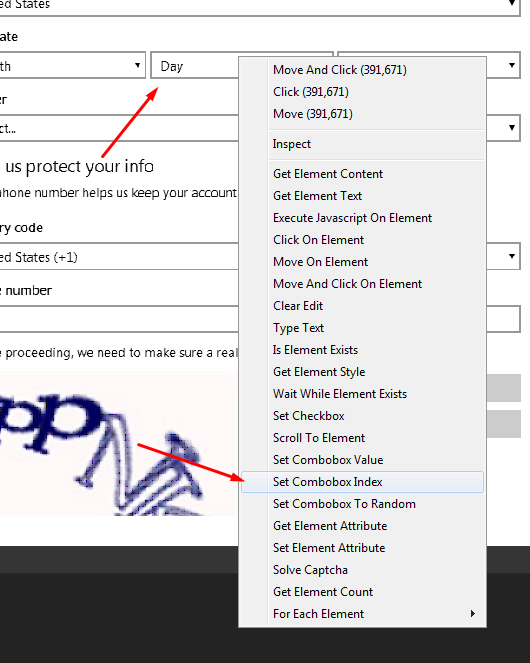 You can set combobox with one of three actions: “Set Combobox Index”, “Set Combobox Value”, “Set Combobox To Random”. It takes one integer parameter and sets combobox to value at that index. This action works on all comboboxes, including custom one, so prefer it to others. Internally it uses type action with arrows to achieve result. This function takes one string and set combobox value equal to that input value. If combobox won't contain that value, combobox index will be set to last one. In case if combobox don't contain default markup, this function won't work. In that case, use “Set Combobox Index” action instead. Set combobox index to random value, won't work in case of non default combobox. You can use type action to set combobox value. Just type option value on combobox element with <RETURN> at the end.